I've been telling myself that I have to note down birth stories of my 3 kids, before I forgot ( Been forgeting little by little, blame it to the pain killer taken during labour). Let's start with Lucas's. It's 2 more weeks to due date, I started working from home due to the inconveniences of driving to work ( For your info, I drive 90km everyday to/ fr office). I went for my weekly check up @Subang Specialist in the evening, with hubby & 2 little ones. Doc performed a check 'under'. ANd he said it's 3cm dilated ( last week was 2cm) & kept on emphasizing that it's going to be very 'SOON'. Since my elder 2 wasn't delivered closed to EDD, so I thought it's the same this time around. However, doc suggested to go for induction if there isn't any sign within these 2 days. He even booked me a labour room on Friday 15.01.2010. So I thought, well, if there's no signs for the next 2 days n if I'm not comfortable with induction, I can always call in to make cancellation right. Off we went to Kuchai Lama to meet up with 2 of my close friends for dinner. This is what we'd for dinner, Alaska Crab. Believe me, it's really HUGE !!! And best of all, it's super yummy, & expensive too. Thanks Sam for the dinner !! During the dinner, I started to feel mild contraction on and off, however, it's norm as doc has performed the check just now. I was warned that there might be 'Show' too. So I cant care much, continue eating like normal. Only towards end of dinner, just before dessert was served, I remember, it's 8pm. I started to monitor the contraction, it's quite a regular one, every 5 mins. Then I started to alarm hubby and friends, that I might be in labour !! Everyone got so excited !! Without delaying, I gave mum a call, told her I'll be sending the 2 elder kids to her. Off, we drove to mum's house & I even took a shower before admitting. Contraction has been very regular, 5 mins. I started to medidate while on the way, but it's so hard to concentrate !! Imagine, I'll be seeing my baby soon...a long & suffer waiting ! @9.30pm, in the labour ward, after all the checking & monitoring, blah blah blah....I was told that doc wont be coming in, I shall 'enjoy' my contraction till it's time to deliver ! I thought 'Well, I'm going to have a natural birth this time, no painkiller, no epidurial !'. @12-6am:Contraction comes n goes. After awhile, it becomes irregular, less pain. I cant sleep, so I walked around the room while hubby was already in his 'lalaland' after he's back from supper. Contraction is so mild yet it's enough to wake me up each time it comes. Didn't really sleep well, coz midwife did come in to check the dilation. @8.30am, doc came in and broke the water bag. and I was told not to get down from the bed. Contraction has become stronger by then, but still, it's not that 'Strong'. I started to practised 'hypnobirthing'. Keep my mind occupied with all the happy moments, beautiful baby faces..it helps though not 100%, but at least keeps my mind busy. @11am, can you believe I' already in 15 hours labour, still no show of baby coming out soon, only 4-5 cm dilated. Doc suggested to put me on drip, means induction !! Ohh no, not so 'natural' birth ya, no choice, coz it may create stress to the baby if the labour is too long. @12.05pm, doc came in and checked, he said 'Very soon, 8-9cm dilated'. The pain was unbearable that I finally opted for Oxygen. @12.25pm, While I was screaming in pain, I knew it's time to meet my miracle baby. I told hubby that I'm going to 'push'. He pressed the bell, so the midwife came in and checked. Yeap, it's fully dilated & asked me NOT TO PUSH. I was so pain that I can hold it anymore. Guess what she did, she closed my leg, let me lie down on my back again, while waiting for doc to arrive. OMG, I cant believe she did that to me. I was so pain that I was so restless to argue with her. Doc came and then start the pushing again. I think it's either I do not know how to push or baby was so stubborn, doc performed a vacuum after 2 contractions. At that time, I cant care much as long as my baby is out and safe !! @12.30pm, my miracle baby Lucas is born, weighted at 3.56kg. Doc performed a check on his neck and back to confirm if paed needs to be in immediately. Tks God, doc told me it's not necessary, nothign seems to be 'abnormal'. 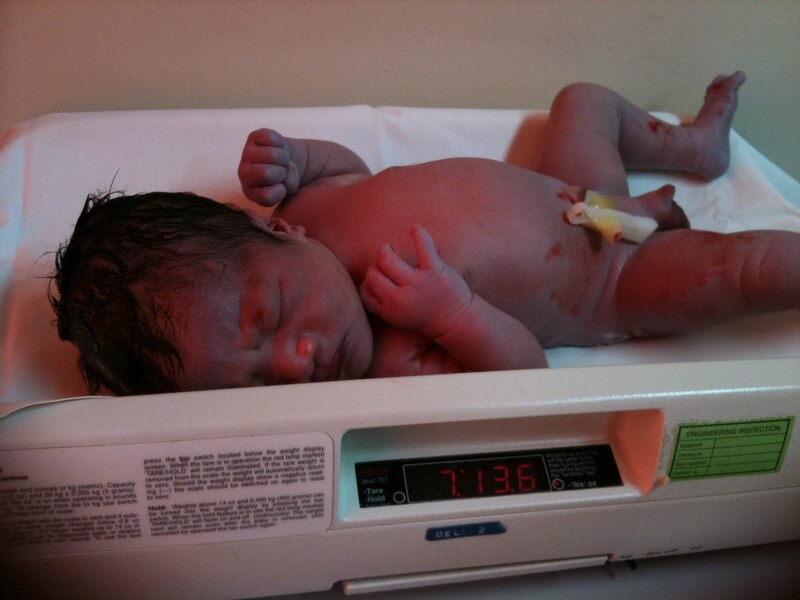 Midwife carried the baby to me, Ohh, my beautiful baby, I fall in love with him immediately !! Baby was sent to nursery while hubby follows the midwife coz there'll be forms to fill in. After stitches, I was left in the labour ward for 2 hours. Guess what, I was so tired & hungry. For the past 2 labours, I 'KO' immediately after I said Hello to my baby. But this round, I was still pretty alert, I can even asked doc to take a pic together with him. I remember scolded the midwife for pressing too hard to get the blood out, it's so painnnnn....!! I was so hungry that I told the midwife that I want a milo. Today, marked another milestone for my miracle baby, Lucas. 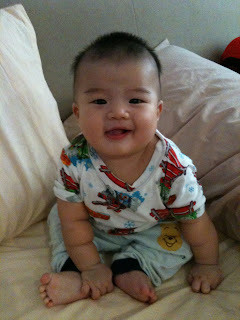 13.07.2010, Lucas boy turns 6 months old today, yeahh !! He's 7+kg last measured(5 mths), by now, should be around 9+kg. Baby Lucas is such a happy baby, never fails to make me smile. He likes raising his hands when he sees me, wanting a hug. So far, he's the easiest to take care among 3. He can be left on the cot after he wakes up in the morning, plays with toys, while waiting for daddy and mummy to dress up to work. Whenever I carry him from the cot, he'll return me the sweetest smile of all !! We went to Chili's, Empire Shopping Gallery to celebrate baby 6mths old and also to mark mummy successfully breastfeed for 6 months, fully breastmilk. Intend to breastfeed baby as long as I can. Hope I can break my last record, 2 years & 3 months !! Lower back pain is back, my old friend !! That's one night which I cant even stand straight and walk when woke up middle of night to go pee. Luckily hubby was still awake, he came up fast to give me some supports, rub my back with deep heat cream which helps to relief the back pain. I started to feel 'Not so mobile' like I used to, can hardly roll from left to right, vice versa. Which really makes me feel like I'm a Giant Hippo. OMG, it's only 28 weeks, and I'll have 3 more months to go !! I know I know I know, some of you may have been told about the amino test result, yes, the result says baby is normal. No further treatment required...YEAH.....IT's time to eat healthy, stay healthy !! At last, the test was performed as planned last Thursday. The whole process was smoother than expected. Earlier, I was told by a friend that it's a torture and unbearable pain. It turned out to be much better than expected. We arrived at Dr's clinic @5.30pm, waited awhile before doc arrived. I was the first to enter the treatment room. At first, doc worried that the baby might not be big enough for the test, coz I was 15 weeks +, and normally the test is performed best when baby is 16-18 weeks. I was worry, what if it's not the time yet, and I need to wait and come back another time. He did one round of ultrasound scan, and he instructed the nurse to bring the needle and accessories. I then asked him 'Now ?' & he said 'Yes'. He put a pillow below my buttock, and 'warned' me not to touch his hands even if I'm scared/ pain. He then used a needle, about 7 inch long, stretch abit of my belly and 'poke' the needle into my tummy. With the ultrasound, he make sure that the needle was poked at the right place without hurting the baby. He then used another needle to pull the amino fluid from my tummy. It's yellowish in colour. He pulled out both the needle. It's full of blood. Just when I thought it's over, he said 'Sorry' and there go another 'poke'. This round, he extracted 2 full tube of fluid. After all has done, the nurse put a plaster on the place where he's poked, and told me not to remove it till 3 days later. It's done. Yes, just that, within 10 mins. He prescribed me with some antibiotic, multi vitamins and folic acid. I was told to have 3 full days of rests, without house work. Here comes the most concern part, 'When is the result available ? '.......Doc said '3 weeks'....OMG...another 3 weeks of waiting ?? I will be torture for another 3 weeks of waiting ?? Help....anyone ?? It's getting closer to the D-day....6th Aug. This is the day I'll be going for the AMU Test. Mixed feelings now. As much as I'd like to know the result asap, on the other hand, I'm doubt about how to get through the 3 days of bed resting( Doc said gotta bed rest for 3 days) ? Any suggestions ?? Perhaps it's time to dig out all the TVB series I've copied but yet to watch. I'm not sure if I'm having migraine or muscle pain. It's the usual spot where I've migraine, however, it doesn't cure even with the pain killer which doc prescribed. Worse is the after effect of taking the pain killer, it makes me loss of appetite, AGAIN ?!! Yeah, again !! I've also tried Deep Heating Cream, it helps a little, but after awhile, it comes back. The most enjoyable moment is when I'm asleep, 15mins after I wake up, the pain will start again, everyday since last week. This evening, the pain was almost unbearable, I didn't have appetite for dinner, so I had a can of coke. The most amazing thing happened after I finished off the can of coke. The pain got relief !!! Ohh what a relief !! I hope it'll never comes back !! Thanks all for the emails, SMS. Thanks for the prayers...I'll be strong ! !